Following the dress from the 1920s through changing times...from the 'Transformation of the Qipao' exhibition, Hong Kong (2012). The roots of the Qipao can be traced to the identity of different noble clans who held power as well as wealth during the Qing dynasty, because the Mandarin term "Qi Pao" (Banner Robe) was used to describe the long dress worn by women belonging to the Eight Banners (clans) of Manchu. 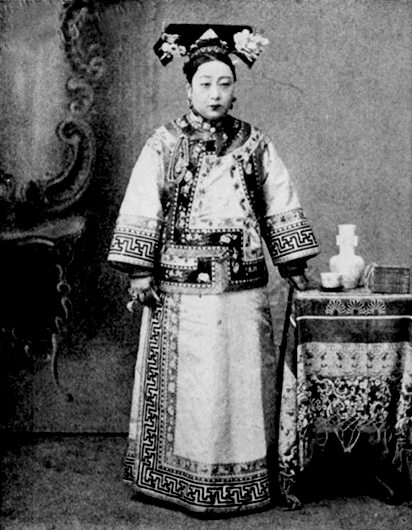 It was a long A-shaped, loosely fitted and squarely cut silk brocade robe adorned with different embroidered motifs that reflected the status, position or title of nobility the wearer held, and was usually worn over several layers of silk under-dress (as you can probably tell from the layered sleeves in the photo). The slight variation in styles in different regions, the choice of silk brocades from different fabric weavers and being entirely custom made, has propelled the Qipao to an early notion of fashion in China. As the Qing dynasty fell and the world began to flap to the roaring twenties, the Chinese Qipao began changing to keep up with the fashion of the time. 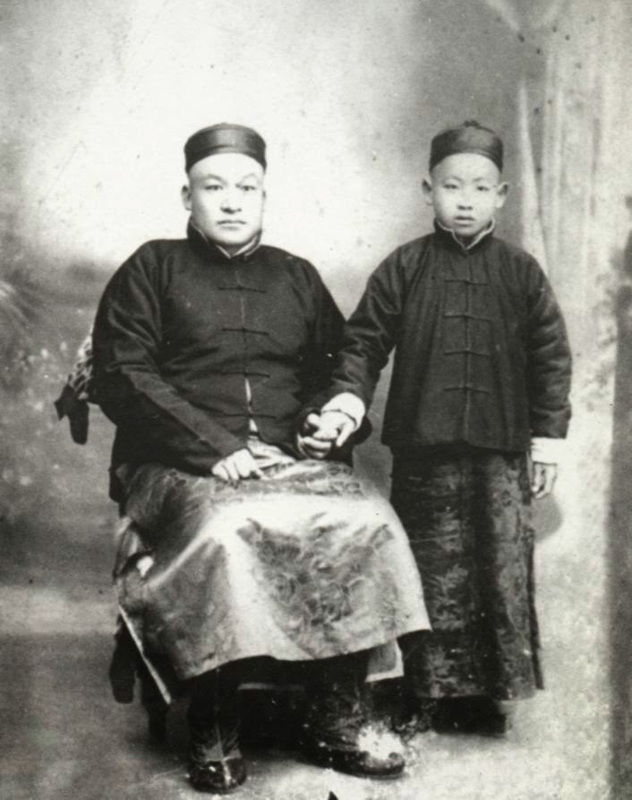 With a period of uncertainty, some women even feared wearing the Qipao in case they were linked with the Qing dynasty, and hid the Qipao opting for simple two piece garments. But as schools and universities started opening up for women to join into an intellectually modern time influenced by political change and ideals from the West...young ladies daringly looked for a new way to express themselves. 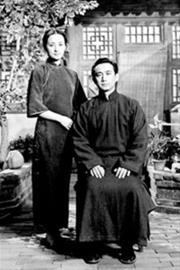 The answer became the Cheongsam (Changshan/Changpao/Changfu - Mandarin); which literally means long robe or clothing in Cantonese, that was a commonly worn simple long shirt or robe (often without embroidery but sharing a mandarin collar and loose shape of the ancient banner robe) by men. In a significant move to represent the new intellectual movement and equality in education for women, the Qipao became a symbol for the new intellectual woman in China. By the early 1920s, the length of the hem was shorten up to the ankle and the sleeves stopped a little below the elbow as it became more acceptable to reveal the feet and lower arm. Western influences appeared in the form of imported fabric, but details such as material type, embroidery and clasps still could reflect the wearer's social status or background. 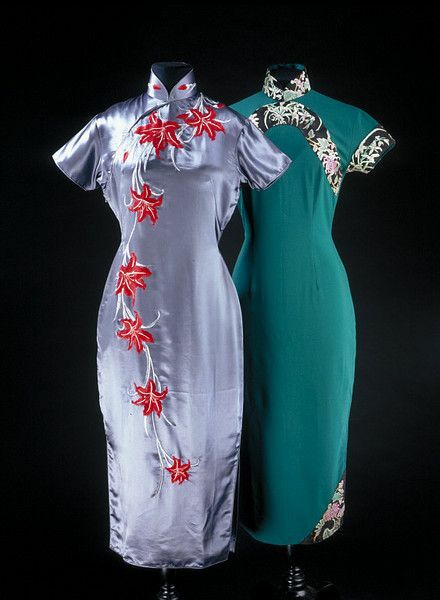 As the 1920s progressed, the Qipao became more fitted at the waist to better encapsulate the female form, the number of silk under-dresses fell and varieties were made for different occasions from parties to daily wear. 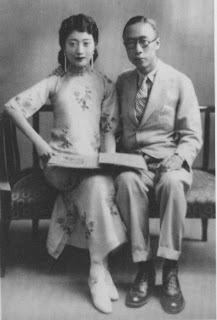 The more glamorous ladies took to wearing Western Marcel Waves (finger waves), Art Deco styled jewellery, pearls, cardigans, capes or shrugs with the Qipao...as you can probably see from the photo (below) of Imperial Concubine Xiang (1913-1949). The golden age of the Qipao continued as it remained highly popular and at the height of fashion throughout the 1940s, especially in glamorous cities such as Shanghai which was known as the pearl of the East and labelled the Paris of Asia. The Qipao became more about chic sillhoutte as embroidery and hard to care for silk fabrics became pieces for specil occasions. As women started ventuting out of homes to work, the Qipao became an even more practical daily garment with focus on easy to care fabrics, plainer styles and vibrant patterns. Practical western styles or imports such as zips, shoulder pads, buttons or full lace were also inventively used by some tailors. 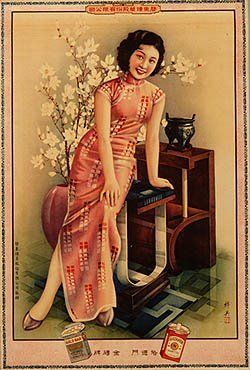 Calendars with beautifully painted female models in Qipao dresses graced the walls of most homes, advertising products, depicting the most fashionable styles in Vogue and continued to fuel the Qipao's popularity. But when the war hit, fashion came to a halt with the Qipao being hidden in the bottom of suitcases and people fled for their lives. After the war the People's Republic of China was formed, the Qipao was gradually phased out in the mainland for its ideological links and many Qipao tailors fled the country. But the Qipao was still worn by Chinese ladies overseas in places such as Malaysia, Singapore, Taiwan and especially Hong Kong; where many Shanghai Qipao tailors had fled to. Hong Kong prospered in the 1950s and Qipao was the chosen daily wear of most women, so the custom made Qipao became a booming trade! The well skilled tailors in Hong Kong led the Qipao fashion by incorporating more Western styles into the Qipao, such as the shorter tapered hem to echo the fashionable pencil skirts of the time, front as well as back waist darts (seams) to create a tighter hour glass silhouette, higher side slits to ease movement and a functional zip to make the Qipao easier to wear. Video: 'Transformation of the Qipao' exhibition in Hong Kong (above). The emergence of the 60s mini skirt led tailors to create a mini short length Qipao which created public outrage in Hong Kong and a proper dress movement was formed in protest, so many girls opted for the midi Qipao which ended just below the knee. Geographical differences also led to the Cantonese name of Cheongsam being used more often, and cultural fusions enabled the Qipao to be tailor made with local wax painted or dyed Batik fabric in places like Singapore and Malaysia. [To find out more about Batik fabric and prints, please click here: en.wikipedia.org/wiki/Batik] The Qipao gradually became occasional wear, rather than daily wear, as more Western forms of clothing were adopted in different places. 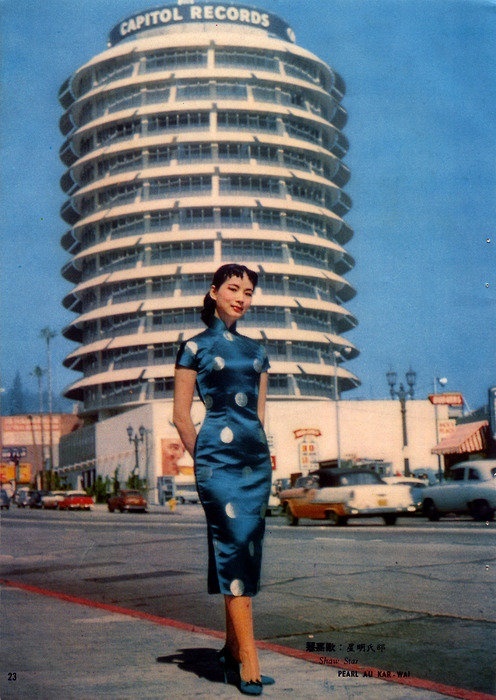 From the 1970s the Qipao firmly became an occasional dress used for special events such as weddings, beauty pageants, parties and Chinese New Year festivities, but it was also adopted as uniform in some schools and restaurants. Reaching Modernity: Silk and fur Qipao designed by John Galliano for Christian Dior Fall 1997. 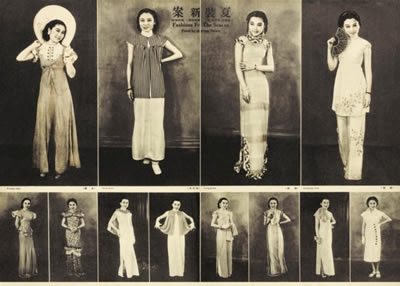 The evolution of fashion in 1930s Shanghai.....consisted of a mix in Eastern and Western clothing, but the Qipao became the iconic leading trend and evidence of high fashion at the time. 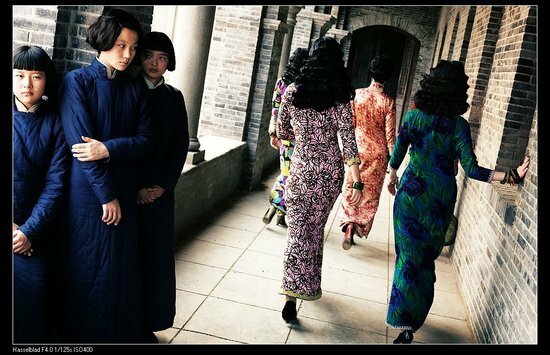 The stark contrast between the loose school uniform Qipao and the glamorously fitted sing-song girls' Qipao dresses of war-torn Nanjing 1937...in the film 'Flowers of War' (2011). Personally, I have always preferred the Mandarin name Qipao, as I find it a more fitting name to describe a beautiful dress that has been draped with such richness in history and endured such heavy changes through time. Call her by her different names if you wish.....Qipao, Cheongsam, Chinese dress or dress of cultural identity.....she is simply a dress that is about the woman inside and a frame of her true beauty. I hope Part One of the Qipao Love (All about Qipao) series has helped you lovely darlings discover a little bit more about this unique dress, and perhaps intrigue you enough to try it one day! Here's wishing all you lovely darlings a fabulously merry weekend! Hi May! Nice overview of the qipao and its evolution. I was excited to see Wilson Shieh's ad for the "Transformation of the Qipao" exhibit. I'm a big fan of his artwork. Happy holidays and best wishes for 2013! Thank you Dave! Glad that you liked the post and I liked the illustration on the transformation of the Qipao too but didn't realise who the artist was! Hope you had a lovely Christmas and will have a brilliant New Year...Happy 2013! Thank you Rob! Glad you enjoyed the post and like my blog! There shall be more posts to come on the Qipao. Have a Happy New Year! Great post thanks for sharing you shared such a beautiful pictures and video. My mother had several custom-made cheong sam (qipao) made for her in 1967 before she emigrated from Hong Kong to Canada. She passed away a few years ago but we still have these exquisite dresses carefully packed away. Too precious to give away, they are a time capsule from the height of Hong Kong custom tailoring, created by master craftsmen many of whom were Shanghai refugees. Thank you for stopping by! It is indeed an amazing collection to keep as the tailoring must be exquisite....it will be rare to such gems today with the mass-sold market of factory made Qipao. Shanhai taloring masters were known as one of the best in the world. Perhaps it can be passed down to your next generation as a family heirloom....it will be a beautiful gift for the future generations to come. Thank you for the great post! This really helped me with my project on the qipao. Keep up the great work!